Two particularly dangerous firefighting hazards that can occur during modern-day firefighting operations inside buildings are the phenomena known as flashover and backdraft. This is when an entire smouldering room and its contents can be suddenly engulfed in a rolling ball of fire. It is clear that developments in the building industry and the increasing use of plastic and other man-made materials used for internal fixtures and fittings have increased the likelihood of flashover and backdraft within compartments. Recent experience with these phenomena has underlined the importance of firefighters being able to operate safely and effectively, trained to recognise the stages of fire development, and to take action to safeguard their personal safety. Much of the improved practical competencies relating to compartment fire behaviour over recent years have been derived from training sessions using realistic live fire training units. These have been progressively designed and developed to reproduce fire conditions and create flashovers and backdraft potential so that firefighters can recognise certain pre-conditions and take the appropriate action to protect themselves. These burn a quantity of soft wood or chipboard-type timber within a steel container-style unit which has variable doors and windows to alter and regulate the air flow into the burn area, and thus provide some basic control over the combustion process. Window Unit (2.5 x 2.5 x 6.5 metres) – These smaller units allow trainees to externally witness the various combustion stages in which instructors will create both flashover and backdraft phenomena by altering the air flow into the burning material inside the unit. Attack Unit (2.5 x 2.5 x 13 metres) – Inside this larger unit, students wearing breathing sets and full PPE are able to practice cooling techniques using water sprays to control the build up flammable gases. 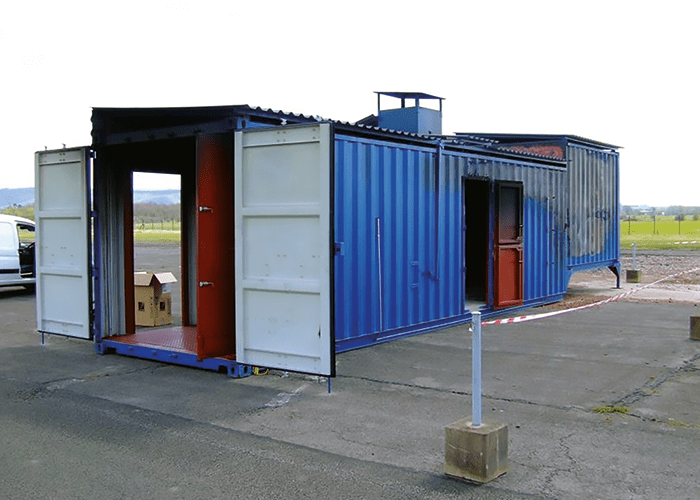 Demonstrator Unit (2.5 x 2.5 x 13 metre) – Inside this unit, students are able to practice full compartment firefighting tactics, including gas cooling and other protective measures. 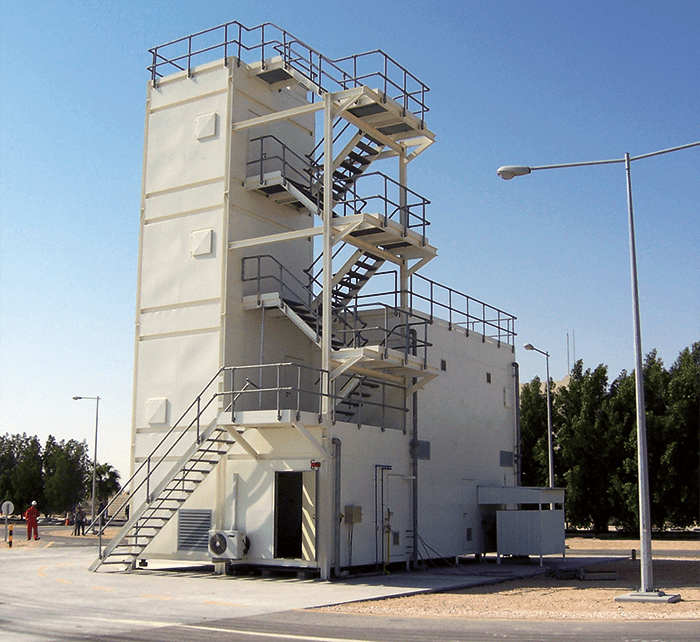 A four floor multi-purpose gas-fired FBTU supplied to Qatar Petroleum Fire and Rescue Service at Ras Laffan Industrial City, Doha. This has eight different training fires on the various floors. Gas fired fire training units are designed to create realistic fire conditions, usually burning either propane or butane LPG in a safe, controllable and repeatable manner. These structures consist of single or multi-floor modular steel or brick construction with various compartments and rooms. Inside these structures are LPG fired burners which create a realistic flame signature which emerges from within metal ‘furniture’ such as a cooker, television set, bunk beds or double beds, or workshop equipment. The control systems of gas-fired units are linked to a PLC computer programme that provides a very high level of safety. All fire scenarios are controlled from a central point, and once armed are linked to a local start/increase/reduce/stop control in each of the fire rooms where once an exercise is ready to commence, it is entirely under local instructor’s supervision. The computer software programme allows fires to be configured to provide a number of different fire situations, each with a precise flame height and temperature, and simulate fire spread from one room to another. Cosmetic smoke can be added to provide various levels of obscuration, and theatrical sounds such as persons calling out for help add even more to the realism of the training. The software programme also provides for constant monitoring of the training temperature which does not normally exceed 350C at ceiling level, and also constantly monitors for unburnt gas within the various compartments. In addition, the software programme captures data throughout the live-fire training sessions providing a record of the precise training conditions which students have experienced. International gas standards apply to the design and construction of gas-fired training units and temperature and gas monitoring equipment has to meet national codes. The control system is linked to an automatic safety-shut down in event of pre-set temperature levels being exceeded. In event of a trainee getting into difficulty, each fire room has an emergency shutdown button which, when activated, will immediately shut down the gas burners, activates powerful ventilation fans and lighting, and clears the heat and cosmetic smoke from the unit within little over a minute. A very significant advantage of gas-fired simulators over carbonaceous burn training units is that they can immediately and repeatedly recreate fire scenarios at exactly the same level of flame height, temperature and smoke obscuration. This enables trainees to practice firefighting techniques for the same scenario again and again if required, all under very controlled conditions, before perhaps moving on to another hotter, more difficult and challenging exercise. The need for regular fire behaviour training has been emphasised in many countries in recent years by the steady reduction in actual recorded fires due to the success of fire prevention campaigns. A direct consequence of this is that firefighters may have a reduced exposure to real-life fire incidents. Thus for both trainee or experienced firefighters, the ability to repeatedly practice door entry and gas cooling procedures under realistic conditions is of vital importance. Providing firefighters with meaningful training that raises understanding, competency and safety when facing real fire situations reduces the ever-present danger of flashover and other hazards.